Emily's Chocolates, online at emilyschocolates.com, is the ultimate store for chocolates and gourmet foods galore. Emily's Chocolates not only offers a huge selection of delicious chocolates but other food, and gifts as well. Food gifts at Emily's Chocolates include nuts, chocolates, and even cookies. Gift baskets from Emily's Chocolates provide the perfect mix of gourmet goods for those with a sweet tooth. Specific occasions that Emily's Chocolates cater to include Christmas, Valentine's Day, Easter, and also make great wedding favors. Satisfy your sweet tooth or the sweet tooth of a special someone by giving the gift of Emily's Chocolates. Save on your Emily's Chocolates order with the best coupon codes, deals, and promotions from RetailSteal. Shipping rates at Emily's Chocolates depend on total order, destination, and shipping method. Available shipping methods include Overnight, 2nd Day, and Ground shipping. International shipping is currently unavailable. See website for full details, exclusions may apply. Save 10% on any order from Emily's Chocolates when you use this coupon code online. Click to save. 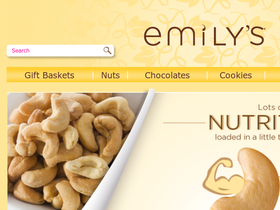 Enjoy 10% savings on all nut orders from Emily's Chocolates when you use this coupon code online. Enjoy a $10 discount on your entire order from Emily's Chocolates when you use this coupon code online. Use code on orders of $100+ to qualify. Save $5 on your entire gift order from Emily's Chocolates when you use this coupon code online. Use code on orders of $50+ to qualify. Find the perfect gift baskets starting at just $19.99 when you shop at Emily's Chocolates. Shop at Emily's Chocolates and find the perfect gift for almost every occasion. Enjoy 40% on your Emily's Chocolates purchase when you enter this promo code! Enjoy $15 savings on your entire order from Emily's Chocolates when you use this coupon code on orders of $150 or more.